Are you experiencing a flood in your bathroom? Swift action is needed to contain the affected areas and prevent mold growth. The problem is best solved by rapidly removing standing water and drying out walls and flooring as quickly as possible. 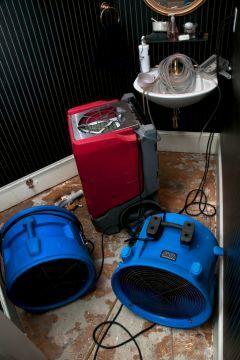 Anytime Restoration has provided water damage remediation services for flood damaged bathrooms for over 28 years. Our fully licensed, insured and trained restoration professionals are standing by the assist you with your water emergency. Call (612) 254-9542 now for immediate action. Call (612) 254-9542 to deploy the damage restoration team from Anytime Restoration. Our skilled teams are standing by, fully equipped to handle your water emergency. There are dozens of local water emergency services that can be called when a bathroom floods. However, few can provide references from dozens of satisfied customers who have benefited from their service. The steadfast team of professionals at Anytime Restoration will stand by their promises. Anytime Restoration's mission is to act quickly and precisely to restore local flood-damaged properties to better condition than they were prior pre-flood. Call (612) 254-9542 and speak with a caring professional from Anytime Restoration and receive prompt and cost-effective dry out and restoration services.